There’s a whole new line of toys hitting store shelves in 2012 based on Disney’s preschool hit Mickey Mouse Clubhouse. Preschoolrs from 2 to 5 love Mickey Mouse Clubhouse so I’m sure they’ll love this new toy line inspired inspired by the show, including space-themed play sets and figures. There will also be a new line featuring fun and interactive play sets from Fisher Price, figures and vehicles inspired by the upcoming Mickey Mouse Clubhouse special, Mickey and Donald Have a Farm, premiering this fall. Mickey Mouse will also move like never before with a new feature plush. Here are just a couple highlights from the new toy line. 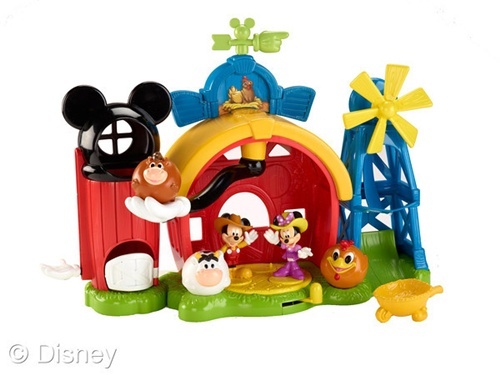 Mickey’s Farm Play Set -Kids can create their own fun farm stories with Mickey Mouse and his friends with this new play set that features realistic animal sounds and fun farm music. Character figures and animals can go for a spin on the dance floor, and a silly hand moves between the silo and windmill. 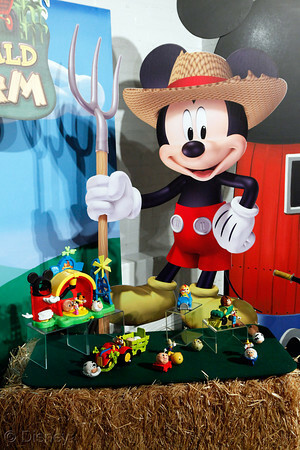 The Farm Play Set will be available in August of 2012, with a retail price of around 44.99. 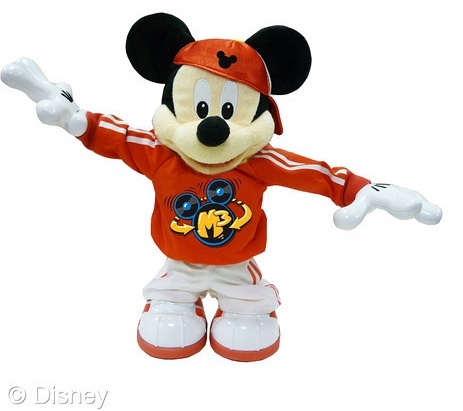 Master Moves Mickey —Decked out in his freshest dance gear and ready to get down, Master Moves Mickey dances and interacts, showing off some never-before-seen break-dance moves, ending in a signature handstand. His moves are hotter and hipper than ever! Master Moves Mickey features original music tracks, funky beats and plenty of awesome humor to get the whole family up and dancing. Mickey will be dancing into stores in August of 2012, just in time for the holiday shopping season, with a retail price of around $69.99. A popular episode on Mickey Mouse Clubhouse spun off into a series of shorts last fall where Minnie and her good friend Daisy Duck find themselves running Minnie’s Bow-Tique, a specialty shop which stocks only bows and bowties. 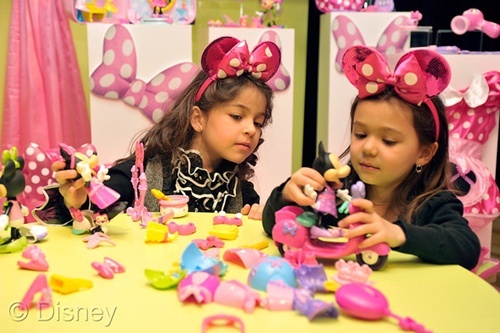 Now there’s a fun new Minnie Mouse Bow-Toons Toy line for girls based on the popular series. The tosy will highlight the themes of friendship, fashion and travel, including an adorable pink and polka-dotted line of Minnie Mouse toys with kitchen and fashion-themed role play from Just Play and dolls and accessories from Fisher Price. Minnie’s Kitchen will be available just in time for the holiday season in August of 2012. The colorful, multi-level play set has everything girls need to cook up their own kitchen adventures. Featuring multiple ‘flipping’ functions to maximize the play experience and creativity in the kitchen, the set includes a sink that flips to a hidden cutting board and dish rack that flips to a hidden blender. Girls can cook up their own treats with a frying pan to flip a Minnie-shaped pancake and flipping recipe book for inspiring new ideas. 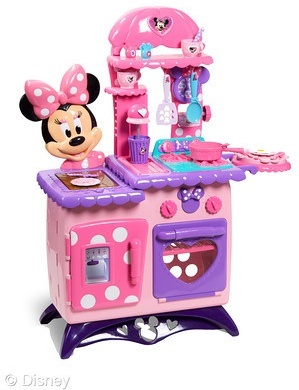 The kitchen includes Minnie’s voice and realistic kitchen sounds. Jake and the Never Land Pirate Ship Toys and More! Jake and the Never Land Pirate toys are coming! There will be a brand new Jake and the Never Land toy line releasing in June featuring plush, and role play toys and accessories from Just Play. 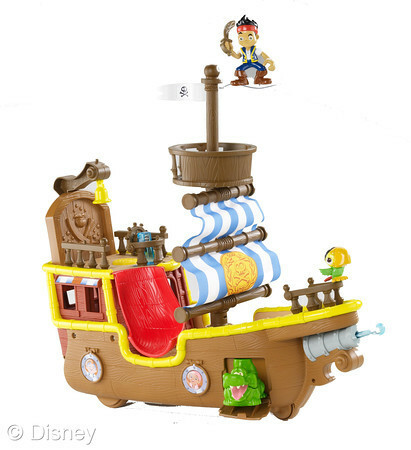 There will also be new action-oriented play sets and figures from Fisher Price, including Jake’s Pirate ship toy! Jake’s Pirate Ship toy has a suggested retail price of $44.99 and will be hitting retailers everywhere in June 2012. The ship is designed after Bucky, Jake’s ship featured in the series, this swashbuckling pirate ship rocks and rolls when kids push it along, with Skully smartly perched on the lookout. Kids can join Jake and his crew to live a pirate’s life through multiple pirate-themed phrases and songs. To really bring the adventure home, kids can fire water out of the cannon or stage a surprise croc attack. The Jake and the Never Land Pirate Ship and the rest of the toy line will be hitting stores in June of this year. I’ll be back with more information on where you can find these toys both online and offline as soon as they start to hit toy store shelves.